Pettis’ MusicWorks instructor, saxophonist Darren Motamedy, invited the aspiring singer to sit in with his band. After the workshop ended, she continued her studies and was soon playing with groups throughout the Seattle area. Her first paying gig came in late 2002 at an assisted-living facility. From there, it was local restaurants and clubs, and eventually to jazz festivals in Boise, Idaho, the Netherlands and Kobe, Japan. 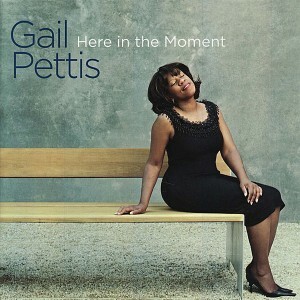 Here in the Moment–which arrives two years after Pettis’ debut release, May I Come In, also on Origin/OA2–consists of 11 tunes, mostly standards, some of which had long been staples of the singer’s repertoire, some of which were less familiar to her when she went into David Lange Studios in Edgewood, Washington, to record in late 2008 and May 2009. Pettis is ably backed throughout by pianists Darin Clendenin and Randy Halberstadt, bassists Clipper Anderson and Jeff Johnson, and drummer Mark Ivester–all frequent collaborators. Soon after moving to Seattle in 1996, Pettis opened a private practice as an orthodontist. She sold that practice in 2006. Today she could probably still fix your teeth, but she’d much rather sing you a song.